PHOTO BY SUMMER REID/GLEANER NEWS: The Bloor Street pilot bike lane project was launched on Aug. 12. The Annex’s cycling community celebrated the unveiling of the Bloor Street pilot bike lane project on Aug. 12. Speaking at the unveiling, Mike Layton (Ward 19, Trinity-Spadina) noted that talks of a Bloor Street bike lane date to 40 years ago, when cyclists were taking to the streets even though the city had no bike lanes. 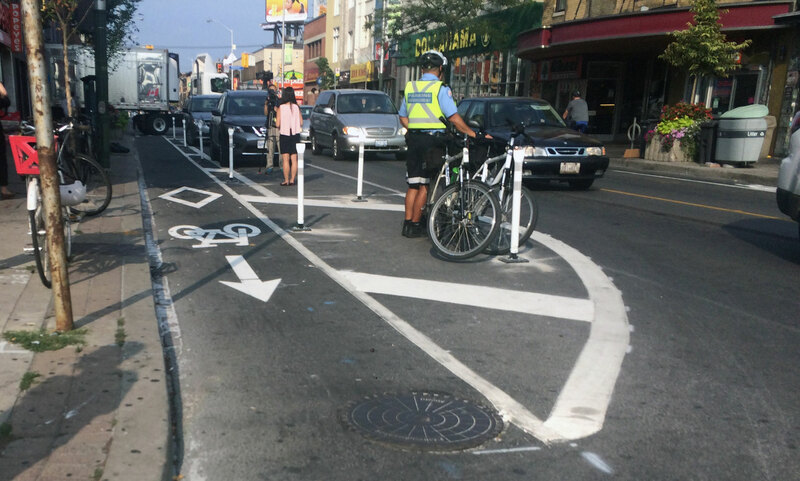 “It’s amazing to see the transformation already underway,” said Jared Kolb, executive director of Cycle Toronto, adding that he hopes the pilot lanes will be extended further east and west on Bloor Street to make streets safer for Toronto’s “most vulnerable road users”. The City of Toronto has partnered Miovision, the Metcalf Foundation, the University of Toronto, and the Bloor-Annex and Koreatown BIAs to conduct a study that will demonstrate the impact such bike lanes have on Bloor Street. This data when collected will include over 4,800 hours of video footage from Bloor Street, monitoring bike, vehicle, and pedestrian traffic along the street. “For far too long, cycling infrastructure and bike lanes has been controversial. It’s been divisive,” said Joe Cressy (Ward 20, Trinity-Spadina), adding that reducing local vehicle traffic by adding bike lanes is the only way to reduce congestion on city streets. Challenging the existing paradigm that places bikes in conflict with cars, the councillor argued that both can exist harmoniously in Toronto.